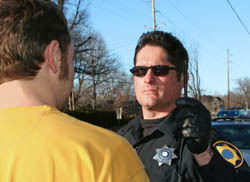 This is a list of DUI enforcement training articles. These articles were written by one of our staff writers who has extensive drunk driving enforcement experience and training. If you deal with intoxicated drivers, this is a “must read” series of articles. DUI Training – The Drunk Driver – Part one of six in a training series on DUI investigations. DUI Training – Personal Contact – The second part of a DUI training series. This covers observations when making contact with the driver of a motor vehicle. DUI Training – Horizontal Gaze Nystagmus – This is the next installment in this impaired driving investigation series. HGN is covered in detail, including proper documentation and testimony. DUI Training – Walk and Turn Test – Aaron covers the walk and turn evaluation in the fourth part of this series of articles. DUI Training – One Leg Stand – Standardized DUI investigations include the one leg stand, which is covered in detail by Aaron. DUI Training – Safety Considerations – The final article in this series, Aaron covers specific officer safety concerns when conducting field sobriety testing. If you work in any kind of patrol capacity, you encounter intoxicated people on a regular basis. When they are driving, they pose a significant danger to the public. It is important that you know how to properly investigate any suspected impaired driving. These articles are a great refresher and can help clarify points of instruction. They are not intended to replace formal classroom training given by NHTSA certified instructors. Your state’s laws and department procedures always trump anything included in these training articles.